While Michigan does have a good amount of freedoms for gun owners, it also has some pretty strict regulations, especially when it comes to handguns. Today we’ll go over everything you need to know on how to buy a gun, and where and when you can use it! First, the bad news. The handgun laws in Michigan are some of the more restrictive ones in the country. It’s certainly not the worst, but take a look at our guides on gun laws of states like Arizona or Alaska and you’ll see what I mean. But the good news is that it’s not impossible to buy a handgun! If you meet certain requirements, of course. There are two situations where you would normally buy a handgun: from your local gun store, or through a private sale. In both situations, though, you are effectively registering your handgun when you make the purchase, either through the record of the handgun sale when you buy at the gun store, or with a license to purchase you’ll have to use when buying from a private seller. Complete a pistol sales record, containing the dealer’s FFL number. Buying from a private seller has some benefits, but there are also more hoops to jump through to do so. Have a License to Purchase. Those two requirements can be deceiving though, as getting the License to Purchase is actually a pretty big hassle. You must obtain a license to purchase from the Chief of Police of the city you live in, or the county, if you are in an area without its own police department. When you actually make the purchase, you’ll need to fill out 3 copies of the license, making sure the license includes a description of the handgun that is sold, with the signatures of both the buyer and the seller. Each person keeps one copy of the License to Purchase. The buyer has to then take the third copy of the license, along with the (unloaded!) handgun that was purchased, to the local police station within 30 days of the sale so they can register the handgun to the new owner. One thing to keep in mind is that the License to Purchase expires in 30 days, so you should make sure you can agree on the terms of the sale, or you may still be trying to settle on a price with the seller when the license expires, and have to apply for a new one all over again. 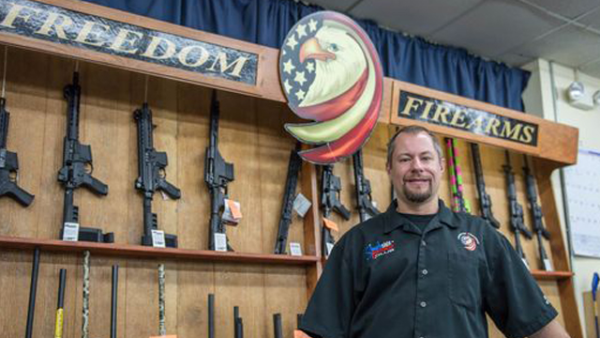 The good news is that if you have a Michigan CCW permit, you can skip all the licensing hassle when buying through a private sale. Even after all that hassle, you may still not be allowed to buy a handgun! 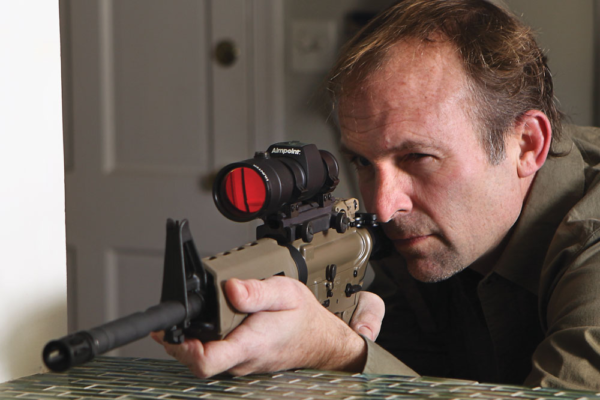 There are certain conditions that prevent you from owning a firearm. For those of you who collect antique handguns, the rules on purchasing firearms don’t apply! As long as the handgun is for display purposes and not made to use modern ammo or is permanently deactivated, you can buy and sell the handgun just like any item you’d buy from your local supermarket. Of course, you’ll need to make sure the handgun you want to buy actually qualifies as an “antique firearm”, or you will have to go through the standard handgun purchasing dance. A firearm using fixed ammo and was manufactured before 1899, and ammo for the gun is no longer made in the US. This means any type of firearm, like a flintlock pistol, whether it was actually made before 1899, or is a replica of a flintlock made before 1899, would qualify as an antique firearm, and not require any of the handgun purchase rules you would normally go through for something like a Glock or 1911. With all of those laws on how to buy handguns, the laws for buying long guns seems a lot simpler. The good news is that there is no License to Purchase like with handguns when dealing with private sales, and you won’t have to go through a background check in that situation either! Of course, all the prohibited categories for handguns also apply to long guns. After jumping through all those hoops to get a handgun, you probably want to show it off! Luckily, open carry is perfectly legal without a permit, as long as you are 18 or older (and allowed to own the handgun, of course!). 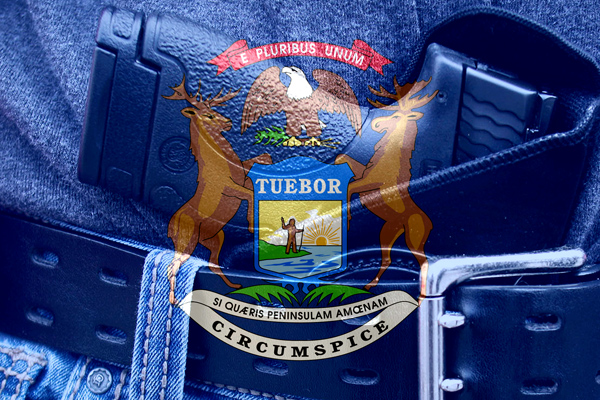 To be able to carry concealed, however, you will need to have a Michigan CCW permit. The steps for getting one are a little involved, so we’ve got a guide dedicated to all the info you’ll need on getting a CCW permit. If you’re interested in getting a permit, or just want to know what’s involved, be sure to hop over and take a look! Even without a CCW permit though, you can still carry concealed in your own house or workplace, and on your own land. Of course, if you don’t run your own business, you would need to check with your boss on the office policy for carrying concealed. Although you can open carry without a permit and carry concealed with a CCW permit, there are still places where firearms are not allowed. Restaurant with an alcohol license. If you are going to a place where firearms aren’t allowed, you can always leave the gun in the car so it’ll be waiting when you get back. Of course, you’ll want to have it hidden away somewhere, and probably locked in a car safe. If you are on your way to the range, or going somewhere else with your gun, there are certain laws to watch out for in terms of how you need to store your gun. In a container and not readily available (but only if the car doesn’t have a trunk). 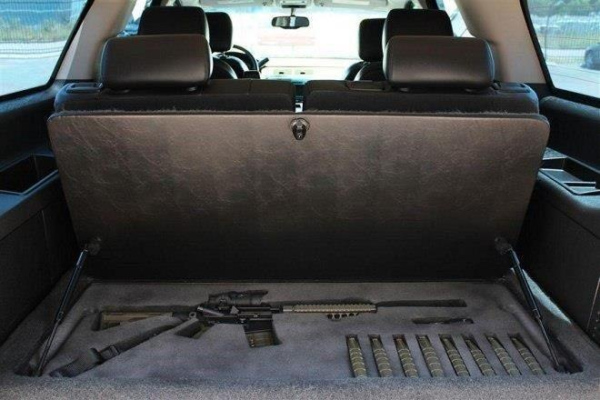 This means that you can’t leave your Glock sitting on the passenger’s seat of your pickup just because you don’t have any trunkspace. Locked away in a car safe is always a good way to go. And for our antique firearms collectors, this rule does apply to you as well, and you will need to have the unloaded gun in a container in the trunk, even though it is not treated like a handgun when you buy it. Transporting long guns is slightly less annoying, but actually more confusing, because of the way the requirements are made. Inaccessible from the inside of the car. Seems like a lot of hassle, but for those of you paying attention, it’s actually very simple! The long gun needs to be unloaded, no question, but aside from that, all you need to do is put the long gun in a case! You can go through the steps of breaking it down, putting it in the trunk, or making sure it isn’t accessible, but that’s all just extra work! Put it in a case and call it a day! Make sure that AR is unloaded! Pellet guns are considered firearms in Michigan. This means everything that applies to standard guns applies to pellet guns, from the purchasing requirements to the CCW permit if you want to carry it concealed. If that wasn’t enough, if your pellet gun does not have a serial number, you are required to take it to the State Police so they can stamp one onto it. If you thought you could get around the pellet gun laws by getting a BB gun, think again! You must be 18 or older in order to have or use a BB gun outside of your yard, unless you are supervised by someone over 18. So when can you actually use your gun? Aside from a day at the range, you’ll probably also want to use your gun if you or your family are ever faced with a home invasion or robbery. Michigan has adopted what is known as the “Castle Doctrine”, which basically allows you to defend yourself when you are in your home, or “castle”. Is trying to kidnap someone from a home, place of business, or vehicle. So if you hear a bump in the night and discover someone has broken into your home, as long as you honestly and reasonably believe the person will harm you, you are justified in using deadly force to meet that threat. In addition to being able to defend yourself against home invasions, Michigan also follows what is commonly known as the “Stand Your Ground” policy, which says you can defend yourself wherever you are, even if you are not at home. As long as you are somewhere you are legally allowed to be (i.e. at a restaurant or a ball game), you do not have a duty to retreat, and can use deadly force if you honestly and reasonably believe deadly force is necessary to prevent imminent death, great bodily harm, or sexual assault against you or someone else. That’s all you need to know about Michigan gun laws! And while you’re out buying that brand new AR-15, don’t forget you’ll need to keep it somewhere safe! Michigan does not have any specific laws on storing firearms, but for those of you with children, or just want to keep your gun collection locked away when you’re out of the house, a strong safe or inexpensive gun cabinet will do just fine. If you’ve only got a couple handguns, then a handgun safe may be all you need to keep your guns protected.